The Moon is a funny place. It’s literally the closest astronomical object to us in the entire Universe, but in some ways we know surprisingly little about it. Located in Lacus Mortis — the Lake of Death! — this interesting feature certainly looks like a volcanic cinder cone. Impact craters don’t generally have such gentle sloping on the inside wall, and such a large, shallow-sloped outside wall. The entire area around the feature is wrinkled and folded, making it look like it’s been heavily flooded with erupted material as well. The crater is about 400 meters (1/4 mile) across, and the whole image 900 or so meters (0.6 miles) in width. We do know for a fact that there was extensive vulcanism on the Moon long ago. The maria — the huge dark regions on the surface of the Moon you can see with your unaided eye — are basaltic lava floods from billions of years ago. There are also rilles: long, sinuous gullies carved by lava flow. Also, in Apollo 17 they found orange glass (scroll down to the 145:28:39 time marker at that link), proof of volcanic fire fountains on the Moon — though more than 3 billion years ago. So we know volcanoes are there, but is this mound one of them? 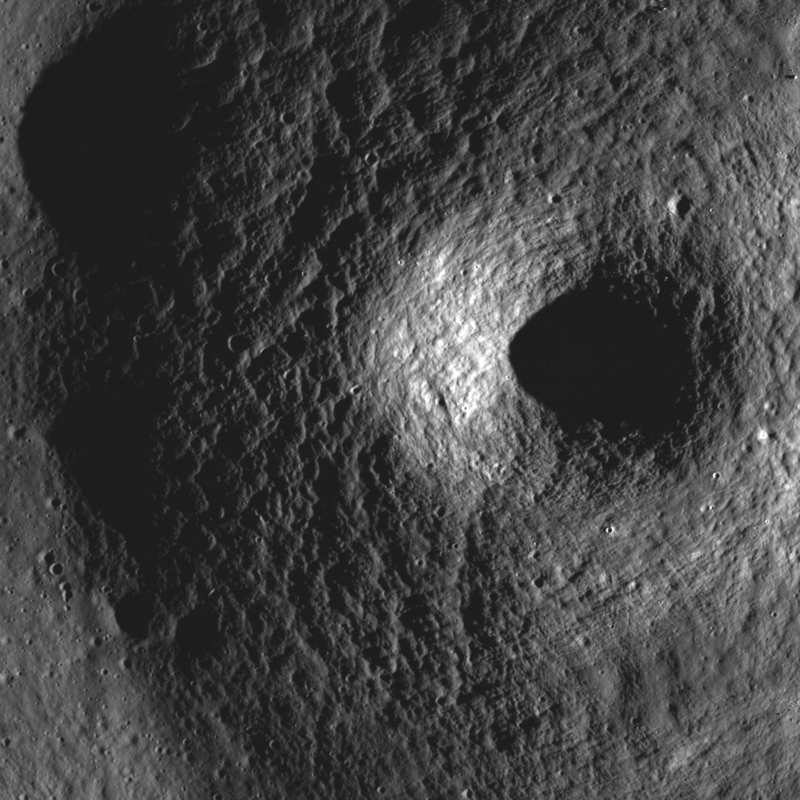 Interestingly, the mound is near another that is also very cinder-cone-like (as shown in the picture here; you can scan the region at very high resolution on the LRO Camera page; the mounds are about 2/3 of the way down). Note the craters which have sharper rims; those are clearly impact events. In the second pit, also note the boulders lining the rim. You can see long shadows being cast by ones at the top. It’s very pretty. There’s really only one way to know for sure if these are twin volcanoes: go there and find out! A rover might be able to do the trick, if it had the right instruments… but I still dream of a day, not too far off, when astronauts with picks and shovels will go there and examine that material with their own hands and eyes. We can learn more in a few minutes of being there than we have in all of history of looking at the Moon from 400,000 kilometers away. LRO was 50 km (30 miles) above the surface of the Moon when it took that picture… 99.99% of the way there. But sometimes, that last 0.01% makes all the difference.